New Humanist magazine asks, “Are we city dwellers or hunter-gatherers? New research suggests that the familiar story of early human society is wrong – and the consequences are profound.” The authors take issue with the familiar story about how the members of hunter-gatherer bands enjoyed a certain social and political equality, but the invention of agriculture, and especially the rise of cities, represented a fall from Edenic grace. Essentially, the existence of surpluses allowed some people to exploit them, and set themselves up as kings (this is the kleptocratic theory of the origins of the state). A wider look at the archaeological evidence suggests a key to resolving the dilemma. It lies in the seasonal rhythms of prehistoric social life. Most of the Palaeolithic sites discussed so far are associated with evidence for annual or biennial periods of aggregation, linked to the migrations of game herds – whether woolly mammoth, steppe bison, reindeer or (in the case of Göbekli Tepe) gazelle – as well as cyclical fish-runs and nut harvests. At less favourable times of year, at least some of our Ice Age ancestors no doubt really did live and forage in tiny bands. But there is overwhelming evidence to show that at others they congregated en masse within the kind of “micro-cities” found at Dolní Věstonice, in the Moravian basin south of Brno, Czech Republic, feasting on a superabundance of wild resources, engaging in complex rituals and ambitious artistic enterprises, and trading minerals, marine shells and animal pelts over striking distances. archaeological evidence suggests that in the highly seasonal environments of the last Ice Age, our remote ancestors were behaving in broadly similar ways: shifting back and forth between alternative social arrangements, permitting the rise of authoritarian structures during certain times of year, on the proviso that they could not last; on the understanding that no particular social order was ever fixed or immutable…. Rather than idling in some primordial innocence, until the genie of inequality was somehow uncorked, our prehistoric ancestors seem to have successfully opened and shut the bottle on a regular basis, confining inequality to ritual costume dramas, constructing gods and kingdoms as they did their monuments, then cheerfully disassembling them once again. Thus might Stonehenge* or Newgrange have gotten constructed without a permanent kingship, priesthood, and bureaucracy to commandeer all the surplus food and direct all the surplus labor. This issue came up this year in class. I mentioned the ziggurat of Ur and the Giza pyramids as evidence of the power of the state. I then showed Stonehenge and suggested that it too must point to the existence of powerful kingship. One student asked, “How do you know they didn’t just get together and build it because they wanted to?” – and I had to admit that she had a point! If some king directed its building, surely we would have the remains of a neolithic palace somewhere. So I had to modify my position – not all monumental architecture points to kingship. I would say that it does indicate economic surplus and (probably) religious motivation. And I’m sure that someone had to be in charge of the actual construction. 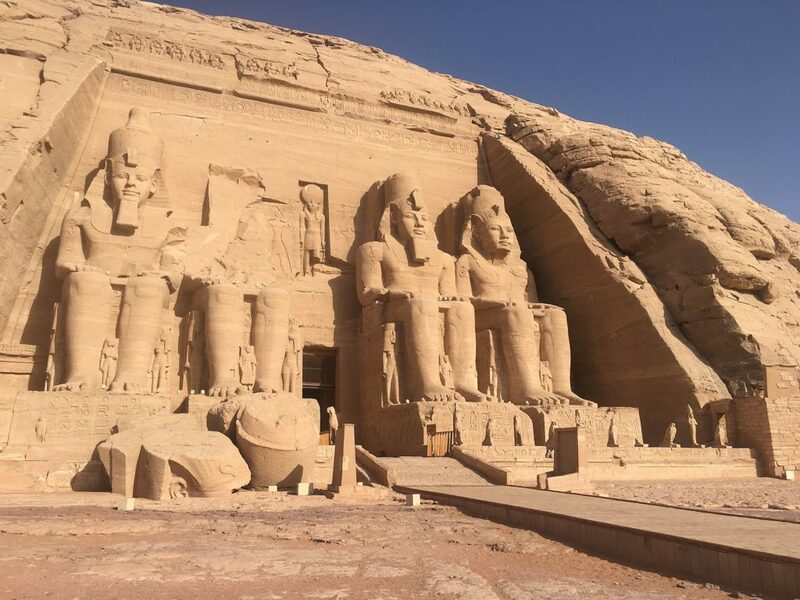 Careful excavation has shown that many of these structures – now plausibly interpreted as monuments to the progenitors of powerful Neolithic dynasties – were dismantled just a few generations after their construction. Still more strikingly, this practice of erecting and dismantling grand monuments coincides with a period when the peoples of Britain, having adopted the Neolithic farming economy from continental Europe, appear to have turned their backs on at least one crucial aspect of it, abandoning cereal farming and reverting – around 3300 BC – to the collection of hazelnuts as a staple food source. Keeping their herds of cattle, on which they feasted seasonally at nearby Durrington Walls, the builders of Stonehenge seem likely to have been neither foragers nor farmers, but something in between. And if anything like a royal court did hold sway in the festive season, when they gathered in great numbers, then it could only have dissolved away for most of the year, when the same people scattered back out across the island. To call someone “Machiavellian” is generally not a compliment, but Niccolò Machiavelli (1469-1527) did not recommend manipulation, two-facedness, and backstabbing on principle. He just said that the prince not shy away from them if he could gain some advantage with them. One hates to hear such advice, of course, but we live in a fallen world, and some evils are lesser than others. The primary job of any prince is to maintain his status, and thus the integrity of his state. If he fails there – if he allows foreigners to invade, or a revolution to occur, or a civil war to break out – then a lot more people are going to suffer. So if he needs, for instance, to take out a potential troublemaker, he should go ahead and do that, without worrying too much about it. Successful rulers, of course, have always acted on such principles. It’s just that Machiavelli was the first to have the temerity actually to write them down, and recommend them as appropriate behavior. Prior to this point, the speculum principis was a genre of sorts, purveying the sort of platitudes that one might read in Life’s Little Instruction Book or All I Ever Needed to Know I Learned in Kindergarten. In the Middle Ages, advice to the ruler was expected to be edifying and uplifting, full of Christian piety and the Golden Rule. So one can see how The Prince might have been really shocking when it first appeared. I would say that Machiavelli represents the other side of Alberti’s dictum that “man is the measure of all things”: man is fallen, and we need to deal with him as he actually is, not as we wish him to be. By all means cultivate your talents, and engage in personal improvement, but don’t act as though everyone else is doing the same thing. HARTFORD, CT–The site of a complex, ever-shifting web of alliances among servers, line cooks, hostesses, dishwashers, and managers, the Sheridan Avenue Applebee’s is a hotbed of Machiavellian political maneuvering, sources reported Monday. The humor here comes from juxtaposing Machiavelli’s grand political principles with the mundane operations of a suburban casual dining restaurant, but I’ve noticed that Machiavelli’s advice really is applicable to other situations than state politics. Indeed, anyone in a position of authority will find some useful advice in The Prince. I would not recommend killing anyone (however discreetly), but what about the pearls of wisdom listed below? I always like to illustrate them with “real world” examples when teaching. It is unnecessary for a prince to have all the good qualities I have enumerated, but it is very necessary to appear to have them. And I shall dare to say this also, that to have them and always to observe them is injurious, and that to appear to have them is useful; to appear merciful, faithful, humane, religious, upright, and to be so, but with a mind so framed that should you require not to be so, you may be able and know how to change to the opposite. We all know people like this, people who never miss an opportunity to burnish their image in the eyes of others, but whose actions aren’t always in accord with said image. This is especially true of ostentatious Christians, who believe that they have God on their side, so it doesn’t really matter how they treat other people. For instance, who could have been more saintly than Mother Theresa of Calcutta? Yet Christopher Hitchens pointed out that of the millions of dollars her operation attracted, some from pretty odious sources, much of it simply disappeared, or was not directed to its ostensible purpose. It remains in bad taste to bring this up. Hitchens quotes Mark Twain: “Give a man a reputation as an early riser, and that man can sleep till noon.” So you’ll definitely want to control your image! A prince should also show his esteem for talent, actively encouraging able subjects… [however, since] a prince cannot practise the virtue of generosity in such a way that he is noted for it, except to his cost, he should if he is prudent not mind being called a miser. I like to illustrate this one with the behavior of a college president I once knew. He would love to come and praise his faculty to the skies, saying how wonderful they were, how they were essential to the mission of the university, etc. And his faculty would wonder, if that’s the case, then why haven’t we gotten a raise for the past five years? Why doesn’t he put his money where his mouth is? But as much as I hate to say it, his actions may have been right, as far as the health of the institution was concerned. To properly reward the faculty for doing their jobs, say by giving an extra-normal, inflation-beating raise one year, would make them grateful… for about two weeks, after which it would become the new normal, and they would be back to complaining about everything else. (There’s an expression for this phenomenon: homeostasis of complaint.) The faculty would then expect another such raise the following year, and if the president were to get into the habit of granting it, he would still have 1. an indifferent faculty (“in general, men are ungrateful, fickle, false, cowardly, covetous”) and 2. angry students, as he would be forced to raise tuition in order to cover this new expense. So no one would win. Machiavelli specifically warned against excessive compensation for precisely this reason – you’ll have to start robbing people in order to reward others, which leads to an unstable and politically unhealthy situation. Everyone realizes how praiseworthy it is for a prince to honour his word and to be straightforward rather than crafty in his dealings; nonetheless contemporary experience shows that princes who have achieved great things have been those who have given their word lightly, who have known how to trick people with their cunning, and who, in the end, have overcome those abiding by honest principles. To which the only possible reply is: yes. Anyone in the rat race will instantly recognize this as great advice. Another noteworthy consideration: that princes should delegate to others the enactment of unpopular measures and keep in their own hands the distribution of favours. This was illustrated every year by the same college president mentioned above. Faculty would go to the State of the College address on the first morning of the academic year, and hear how wonderful everything was. In the afternoon, they would go to the Faculty Senate meeting, and hear from the VPAA about all the problems. I’m absolutely sure this was by design. Of course, you can’t indulge in this sort of thing too much. It is better to be feared than loved, but you don’t want to be hated. Above all things, you need wisdom, prudence, and good judgment. Read The Prince for more, and best of luck in your career! 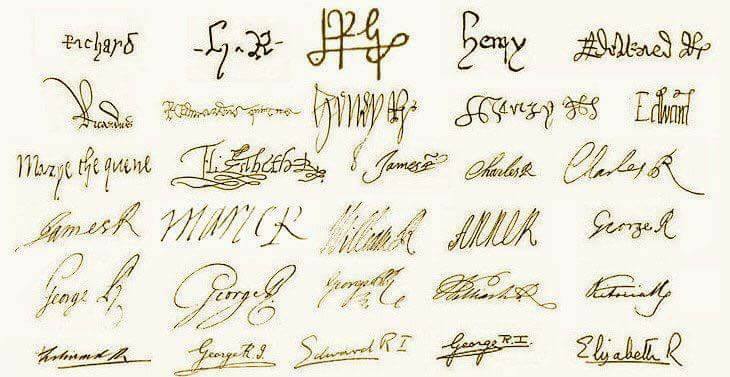 Something fun from Medieval Merriment (via Deb Salata): signatures of every English sovereign from Richard II to Elizabeth II, including Edward V (one of the disappeared Princes in the Tower) – but not Lady Jane Grey unfortunately.